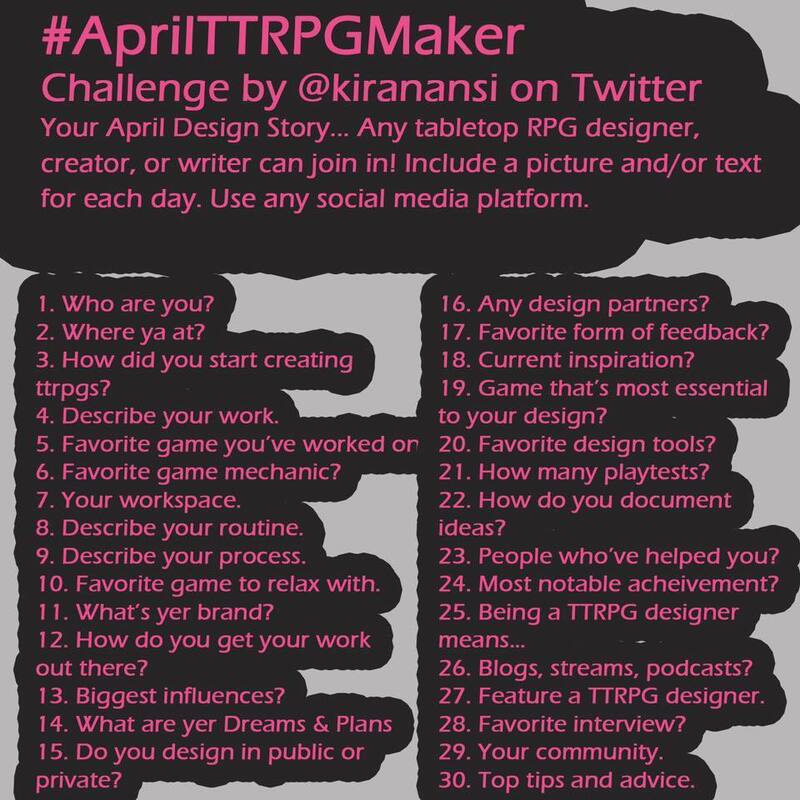 I’m taking part in the #AprilTTRPGMaker Challenge this month from @kiranansi. While I’ve been blogging about and editing TTRPGs for a few years, I am just easing a toe in the water of writing and designing my own material. This looked like a good opportunity to talk about that process, as well as solidifying some of my thoughts around making game material. I hope you enjoy, and if you’re taking part I look forward to reading your posts. My name is Brent Jans and I’ve been a table top gamer since 1980, when I started playing Dungeons & Dragons at the tender age of ten. Since then I have played many games, more often as the game master than not. About five years ago I started blogging semi-regularly about the hobby as Renaissance Gamer (a play on the term “renaissance man”). About three (four?) years ago I hung out my shingle as a freelance TTRPG editor, mostly trying to provide editing services to other freelance or small press TTRPG writers and publishers who might not otherwise use an editor; you can find links to some of the work I’ve done on my Need an Editor? page. Here on my blog I talk about whatever gaming-related idea or topic pops into my head, though I do have semi-regular articles on food at the gaming table, campaign inspiration, and inclusivity. I also blog a bunch about local gaming events and stores, because supporting the local gaming community is important to me. My blog posts are also where you’ll find a bunch of my creations/ideas for my home games, posted to share with other gamers. I also post an editorial once a week over at The Rat Hole, an excellent site for both board game and TTRPG reviews (which you should totally check out, hint hint!). About a year-and-a-half ago I started a D&D 5e campaign (the first time I had played actual D&D in almost ten years), then I started a second one. I created my own campaign world for that, and my players are currently exploring various parts of one of the main areas, Cotterell. I’m excited, because the campaign has me writing new game material on a regular basis, and I’m eyeing some of that for publication. I have wanted to publish for years, but never put my focus into it the way I should have until very recently. I also recently pulled the trigger on a project I’ve had in my head for many years. The Canadian Library of Roleplaying Games is my project to collect, preserve, and discuss gaming material from the start of the hobby until now. It’s very early days, but my meager collection is growing and a number of folks locally have come on board to help. It’s probably the thing I’m most excited about, moving forward. And that’s me. If you have questions, feel free to drop them in the comments below. In the meantime I’ll see you tomorrow!